What 3 nations fell under the control of totalitarian leadership as a result of the worldwide depression of the 1930s? What was Franklin D. Roosevelt's plan for rebuilding the economy of the United States in the 1930s? Why did totalitarian leaders gain power in the years following World War I? What contributed to the rise of the Nazi Party in Germany during the depression of the 1930s? How did the depression in the United States contribute to the worldwide depression? Put the following in order. Place the items in the correct category. Lable the following on the picture- Roaring 20's, Black Tuesday, & Market Bottom. How did the payment of reparations following WWI impact the German economy? The economy became weak and unstable. The economy grew stronger and healthier. More jobs were created in Germany. Look at the picture above. 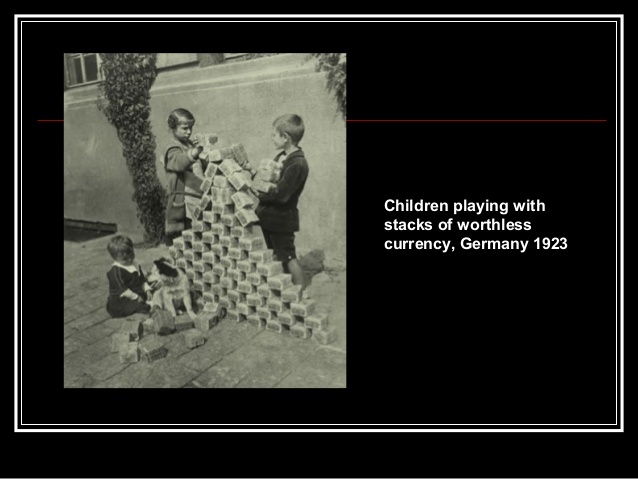 Explain what is going on in Germany for the children to be playing with money.